If you've never owned a P-90-loaded Les Paul then this is the perfect guitar to fill the void. Be warned: you might just fall in love! Brilliant raunchy vibe thanks to the satin nitro finish and P-90s. Extremely cool looks. Well-priced for a USA Gibson. Limited edition. Slightly scruffy finishing. Some may prefer the fatter neck of the '50s version. 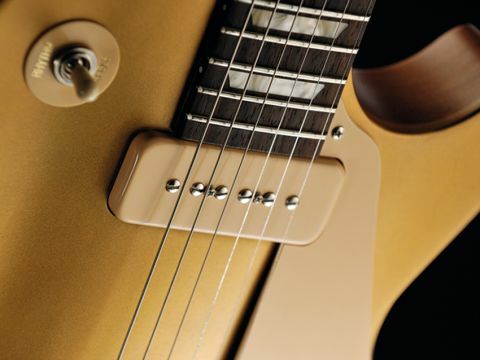 The worn gold of the Gibson suits its workhorse vibe. These two cost-effective goldtops each offer versatile voices. The Gibson has a brilliant ranchy, rootsy vibe suited to '60s pop, R&B and killer slides. We can't get enough of the sumptuous P-90 tones given off by the Gibson. As we write, the second-biggest brand in the guitar universe finds itself at the mercy of mixed fortunes. Having survived and rebuilt following the disastrous Nashville floods of May 2010, Gibson's biggest headline-grabber in recent months, the Firebird X, is still awaiting release following more delays as a result of the exploration of "additional functionality". "The public have been screaming for a more affordable Gibson Les Paul for a long time now, and this delivers it." However, for all the hype surrounding a rare $5,570 'bird, at the other end of the price scale - and with much less fanfare - Gibson has launched some very interesting guitars of late. Alongside the sub-£500 maple-bodied Melody Maker series that debuted at Frankfurt Musikmesse, comes this pair of affordable Goldtop Les Pauls: the Epiphone Joe Bonamassa Les Paul Goldtop and the Gibson Les Paul Studio '60s tribute. The thinking behind this guitar is straightforward: in this economic climate, few can afford to drop three-and-a-half grand on Bonamassa's aged Gibson Custom signature model. Back in the real world, your £499 buys a well-appointed Epiphone version with solid spec where it counts. The BurstBucker pickups, genuine Grover tuners, LockTone tune-o-matic bridge and stud tailpiece, straplocks and a pink-lined Epiphone hard case are all welcome improvements to the basic Epiphone Les Paul Standard template. In addition, the cosmetics have been 'Bonamassa'd': a black-finished back, mixed control knobs plus black plastic pickup surrounds, scratchplate and toggle switch ring. Like the Custom Shop version, these features are all based on the heavily modified '55 Goldtop that came through Joe's father's shop when he was 11 years old. The black plastic parts won't be everyone's cup of Earl Grey, but we like them, and although the metallic gold hue here isn't '50s-accurate, it's not unappealing. We have always felt that a dark back offsets a goldtop finish more effectively than the mid-brown hue sported by the Gibson '60s Tribute model also on test. Indeed, enough people agree for Gibson to offer a dark back option on its Custom Shop '57 VOS model. That said, it wouldn't be unreasonable for the JB Les Paul's high-gloss polyurethane finish and virgin nickel hardware to carry a 'sunglasses required' disclaimer. Next to the worn satin Gibson Studio model it almost looks and feels like a guitar encased in plastic, albeit a very resonant one. Although the Epiphone arrived with its nut cut a little high, it's otherwise beautifully set-up, with the nut lubricated and strung wrapover-style, as preferred by the man himself. It could be this factor alone, or the additional coupling supplied by Epiphone's LockTone tune-o-matic bridge and tailpiece, but this is a taut, responsive, ringing acoustic player, with much more unplugged attitude than its traditionally appointed Gibson cousin. A peek underneath the neck pickup reveals that, true to its word, Epiphone's 'deep-set' neck join sees the tenon extend half way into the pickup cavity. This was also a feature of the recent Slash Appetite model and purists will tell you that it's a key factor in both the tone and sustain of the '50s originals. The neck itself is a chunky '59-style palmful that has polarised opinion, but feels just right as far as our sausage fingers are concerned. Close scrutiny reveals some scruffy finishing around the bass and treble sides where the fingerboard meets the top, and an unsightly white residue in the fretboard grain that's particularly noticeable around the first fret. It's not a dealbreaker on a £499 guitar, but we've seen better attention to detail in this price bracket. Although the spec lists 300k pots for the pickups' individual volume controls and 500k pots for the tone controls, on this example at least, a look inside the control cavity reveals that all four potentiometers are actually rated at 500k. This Gibson USA Les Paul Studio is an altogether different beast from the Epiphone. Following last year's limited edition '50s Tribute is this '60s version, and the chief difference, as you'd expect, is a slim taper neck shape as opposed to the fatter profile common until the late '50s. Pulling the guitar out of its padded, plush-lined gig bag reveals a worn gold satin nitro-cellulose finish that has more bronze in its colouration than the Epiphone Bonamassa model and looks more old-school as a result. Thanks to the mid-brown mahogany back and scraped faux-binding, the top doesn't pop out in quite as eye-catching a way as it would with a darker back and traditional cream binding. That said, there's something about the stripped-down look and lack of fingerboard binding that gives this a cool, workhorse vibe. The guitar-buying public have been screaming out for a more affordable Gibson-branded Les Paul with the classic era cosmetics intact for a long time now, and along with the heritage cherry sunburst and honeyburst versions available, this instrument delivers that in spades. As you might expect, the thinner finish and slim taper neck profile make for a slightly less weightier proposition than the Bonamassa model, and although the Epi shouts louder unplugged, we expect those cream soapbar P-90s to capture our imagination when the time comes to plug in. The combination of the thin satin nitro-cellulose, the absence of fingerboard binding and the slim-taper neck make for a very different and more visceral playing experience than the Epiphone. The fretwork and intonation is good, if unremarkable, and despite the PLEK treatment at the factory, this Gibson hasn't been treated to the same TLC in the set-up process as its Chinese sibling. It's interesting to compare the fit and finish of these two guitars, one at the higher end of Epiphone's Chinese output and the other camped firmly in the 'affordable' spectrum of Gibson USA electrics. Although Gibson's quality control has been much maligned in the past decade or so, on an instrument with a worn finish that will only look better with a few dings and abrasions, it's easier to forgive the occasional scruffiness that can be found around the edges of the carved maple top. Although the Epiphone isn't perfect, it's certainly not appreciably £250 'worse' than the Gibson in any capacity that can be quantified without stripping off the paintwork and scrutinising what lies beneath. Yet for better or worse, there's still plenty of residual voodoo in the presence of that gold Gibson logo transfer on the classic lines of the Studio's headstock. Small valve combo suitably cranked, we give the Epiphone Bonamassa model the opportunity to blow its more expensive relative off the stage. Aside from the obvious tonal benefits, the impact of a 'proper' set of pickups on a guitar in this price range means that there's much more usable mileage available from the guitar's volume and tone pots, however they are rated. This includes a wonderful selection of warm and expressive 'woman' tones that beg for every last drop of sustain to be wrung out of bends and doublestops. There's nothing wrong with Epiphone's standard-issue humbuckers when the volume and tone controls are wide open, but these BurstBuckers bring so much more light and shade to the guitar's palette. In the past, we've witnessed first hand the incredible variation that Joe achieves through subtle manipulation of the guitar's onboard controls, and this signature model certainly gives you the tools - if not the terrifying level of talent - required to do the same. The combination of Les Paul and P-90 pickups has featured on countless recordings over the years. Where the Epiphone is a darker affair, there's a chewy-yet-articulate mid-range bark with a hint of twang here that screams out for open G tuning and your best Keef impression. The Epiphone's Burstbuckers allow for fat, velvety leads, with hard rock attitude just a flick of the pickup selector switch away, while the Gibson is a much rootsier machine that better suits '60s pop and R&B, alt country, indie-rock and pre-Clapton blues lead work. It's also a killer guitar for slide - the bite of a P-90 really comes into its own here. Due to the Epiphone's Burstbuckers being un-potted and the hum issue that fans of P-90s have learned to live with, neither instrument is suited to massive amounts of preamp gain. Predictably, extreme metal is off the menu, however it's a testament to the quality of the Epiphone, and its pickups in particular, that there's no 'better' guitar in sonic terms here - it's just a choice between two different, but equally valid and versatile voices. Which one to buy? If you're a Joe Bonamassa fan, then the decision is a relatively easy one. That said, the imminent arrival of the Gibson Joe Bonamassa Les Paul Studio launched at Frankfurt muddies the waters somewhat, especially if having Gibson on the headstock is of huge importance to you. If it isn't, then this Epiphone is justa great sounding humbucker-loaded Les Paul, period. On the other hand, we just can't get enough of the sumptuous P-90 tones of the Gibson Studio, and unless you can afford the Gibson Custom '56 VOS model, this is more than close enough for rock 'n' roll. You'll also be far less likely to burst into tears when it gets a major ding.